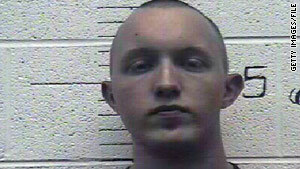 Daniel Cowart of Bells, Tennessee, faces up to 75 years in prison, the Justice Department said. (CNN) -- A Tennessee man accused of planning a "killing spree" against African-Americans in a 2008 plot that included then-presidential candidate Barack Obama as a target, pleaded guilty Monday to eight charges in connection with the crime, the U.S. Department of Justice said. Daniel Cowart, 21, of Bells, Tennessee, admitted to conspiring with Paul Schlesselman of West Helena, Arkansas, in planning to kill more than 100 African-Americans, according to the Justice Department. The two are self-described white supremacists who met online through a mutual friend, the U.S. Attorney's Office in Jackson, Tennessee, said. Cowart pleaded guilty Monday to threatening to kill and inflict bodily harm upon a presidential candidate, conspiracy, intentional damage to religious property, discharge of a firearm during and in relation to a crime of violence and multiple gun charges related to carrying a sawed-off shotgun across state lines. Cowart's co-conspirator Schlesselman pleaded guilty in January to conspiracy, threatening to kill and inflict bodily harm upon a presidential candidate and one count of possessing a firearm in furtherance of a crime of violence. He is scheduled to be sentenced April 15 and faces up to 10 years in prison. Cowart faces up to 75 years in prison under his plea agreement, the Justice Department said.